Randy made this for our saturday New Orleans supper to have on our salad and we all were pratically licking our plates! 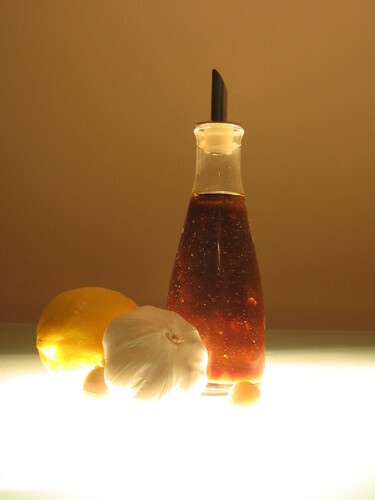 This is quite possibly the best (and easiest) salad dressing EVER! I have adapted it slightly as the original called for plain olive oil plus 6 tablespoons grated parmesan cheese. I prefer to use parmesan infused oil, because I always have it on hand (I just pop the hard rinds left over from parmesan wedges into a bottle of good olive oil. After about a month the oil smells divinely like good parmesan), and also because I had no actual parmesan in the house when I made this a couple of days ago. Mix everything in a jar and shake. How easy is that? It stays suspended beautifully. Refrigerate what you don't use. I made this dressing last night and you are right, it's amazing!! I found myself scrambling around my home looking for the ingredients once I'd read this, thank you for sharing.